What does an elementary school principal do? promote a safe, caring environment conducive to learning. The best principals carry a lifelong love for learning and work tirelessly to promote the full development of the whole student, along the way inspiring and positively influencing their staff and students to be at their academic and personal best. 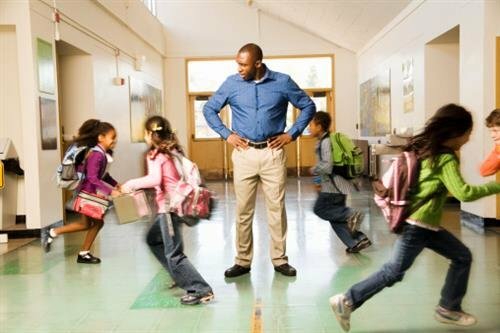 In larger schools, a principal may have one or more assistant principals to help carry out some of the more routine tasks, such as discipline or safety issues. They often have more direct interaction with students than the principal, and may also help coordinate school building maintenance and grounds keeping, as well as oversee many student activities. Whether you teach at the elementary, middle or high school levels, almost all principals begin their education careers as teachers, reports the BLS. Most states and school districts require that public school teachers at the elementary and kindergarten levels have a minimum of a four-year bachelor’s degree, usually in elementary education, with some states requiring a master’s degree after becoming certified. In addition, most states require teachers to be licensed, also called certification, which enables them to teach grades kindergarten through third grade, if certified in early childhood education, or from first through sixth grade for elementary school teachers. The state in which you plan to teach may require that you pass an area of content test in order to become certified, although most elementary-level teachers do not teach just one subject. While you are in the process of gaining your several years’ worth of teaching experience you should be working toward your eventual master’s degree, usually in education leadership or education administration. During this time, you can also be sharpening your leadership, decision-making, critical-thinking, problem-solving and people skills – necessary qualities for any successful administrator. Online courses can be a great way to do work toward your advanced degree – you can study and work at your own pace, and not worry about another long commute! Many respected educational institutions offer the classes you may need, even at the master’s level, so it’s worth your time and effort to do some checking online first. Just as you needed a license to teach, you will also need to be licensed as a school administrator. Your state may require that you pass a test as well as take continuing education courses to keep your license. Again, online classes can be a good way to meet these requirements while still working full-time, without needing to take valuable time from your regular job duties. A good place to start would be as an assistant principal, where you can gain solid experience, without being overwhelmed by a multitude of tasks. With time, effort, further education and experience, you should soon be able to qualify for a full principal position. Congratulations!